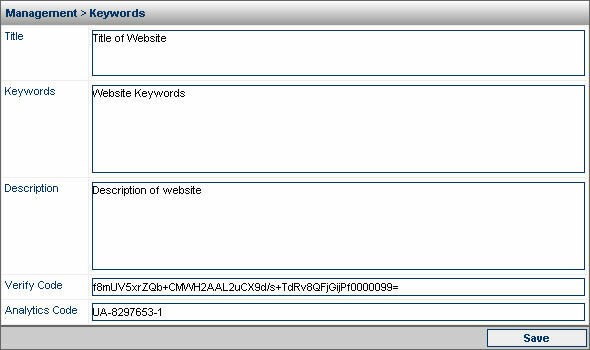 Keywords are a significant aspect of your website. These are the words or phrases that will determine how you will rank in search engines, and how they display in the results. Make sure your keywords are relevant to your site to achieve the best results. Tip: When trying to come up with keywords, write down all the words and phrases that you think are related to your website concept and can be used by people when they search for your website. Click the “Keywords” link in the side navigation. Title: This is the title of your website. By default it will be set to your website URL. The title will be displayed in the top left hand corner in the Web browser. Keywords: This is where you provide words that search engines will use to find your site, meaning words that users might type into a search engine, such as Google or Yahoo. Ensure you choose keywords that are relevant to your site. For example if you have a website about furniture, you would use words like furniture, chairs, tables, etc. Description: This is where you provide a description on what your website is about. Usually contains a brief overview of the company itself, or what the company sells. Your description will show up in search engines results. 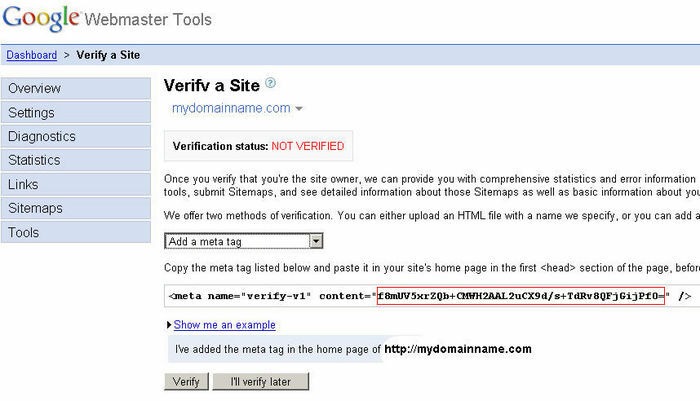 Verify Code: This code is where you would put the verification metatag from Google Webmaster Tools which is necessary to access some of the tools that Google offers. Once you have added your website, you will be asked to add a verification code to your website to prove that you are the owner of the website. 1) Select "Add a metatag" as your method of verification. 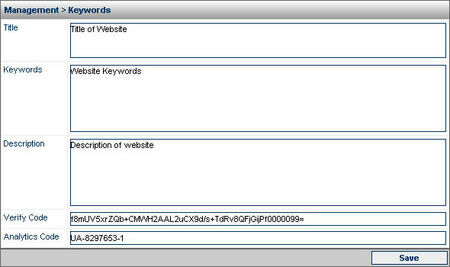 2) Copy the code provided and paste it in the verify code under the keywords section of your website. Make sure that you are only copying the code as highlighted in the image above, otherwise it may not properly work. Click Save. 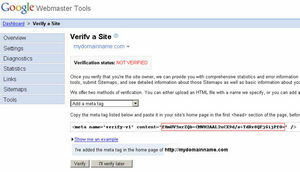 3) Click "Verify" on the Webmasters site to finish the process. You should see a success message. If you are not using a verification code it may be left blank and then you click "Save" to update your changes. When you have created a new profile, follow the steps to get the code. Do not copy the entire block of code. The only part you want is the "Web Property ID". This is the ID that lets google know which site you are referring to. If you do not know which code is the proper id, click continue. There are two ways to get the code. First is on the main page which lists your profiles, it will have the code beside the profile name, which is highlighted in the image above. The second way is to edit the profile, and then click the "Check status" link. It should then list the id. 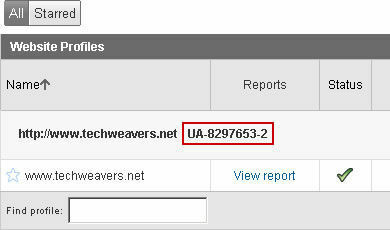 If you have any problems at all, please contact Techweavers. If the code is not proper it will not be guaranteed to work. Note: It takes 24 hours for google to start tracking the website.